Community, learning and inquisitiveness are at the heart of the work of 64 Million Artists. We believe everyone is creative, and that when we use our creativity we can make positive change in our lives and the world around us. We think libraries are amazing. 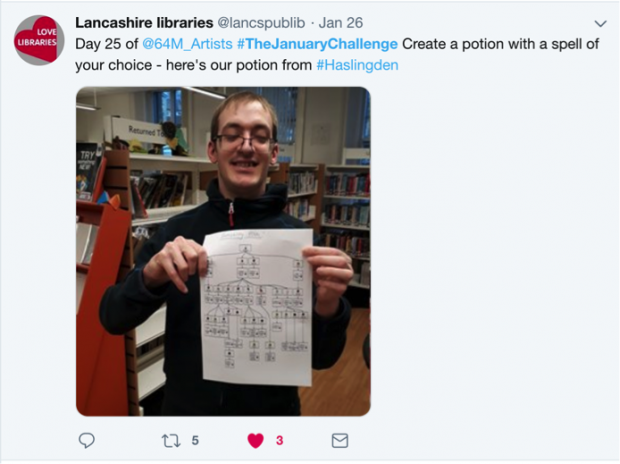 And, as spaces of creativity and community, libraries make a very happy and inspiring home for our upcoming national campaign: The January Challenge. What is The January Challenge? The idea is simple. Each day in January, we’ll send you a short creative challenge that takes just 5 to 10 minutes of your day. Challenges are fun, accessible and free for anybody and everybody to participate in. You could be creating a castle out of random objects in the room, drawing 5 faces in 5 minutes or writing a poem inspired by a book title, or Mondays. Who knows where each day will take you? 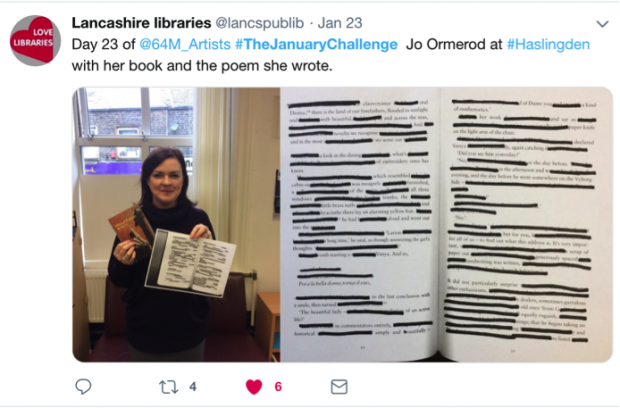 This is the 5th year of The January Challenge. Over 7,500 people took part in 2018. More than 90% said that the challenge had a positive effect on their wellbeing, with many enjoying the process of connecting with others, using their brain differently and trying new things without embarrassment. It’s about being curious, connecting with others and giving something new a go to see where it takes you. Last year, libraries across the country rose to the challenge. In Lancashire, each branch that signed up determined how they would take part, and enjoyed starting conversations about trying something new and developing skills. They found the flexibility of the programme gave them agency and ownership, and look forward to joining us again in 2019! The tweets below show the results of some creative endeavours from Lancashire. Sign your library up to kickstart a creative journey for your community: www.dothinkshare.com/sign-up. Want to share with your library members? We have made this ‘Pass It On’ pack. It is full of written and visual content available to share and promote the challenge with others. 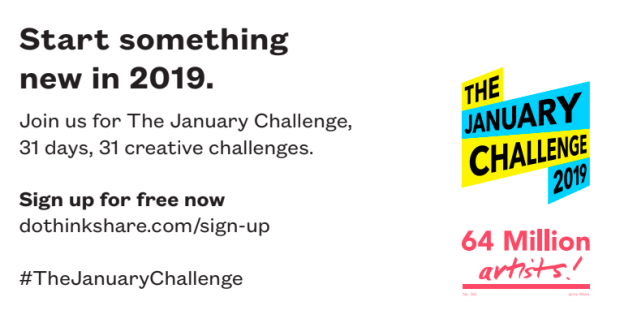 It includes information on the January Challenge, posters for you to print, e-invites, social media graphics, and examples of social media posts. We crowdsource all of our creative challenges from the public. Do you have an idea for a challenge? Perhaps your team, or a group of visitors could think one up together? All ideas can be sent to hello@64millionartists.com or on our social media (Twitter, Facebook or Instagram). Also, please do get in touch if you have any questions.